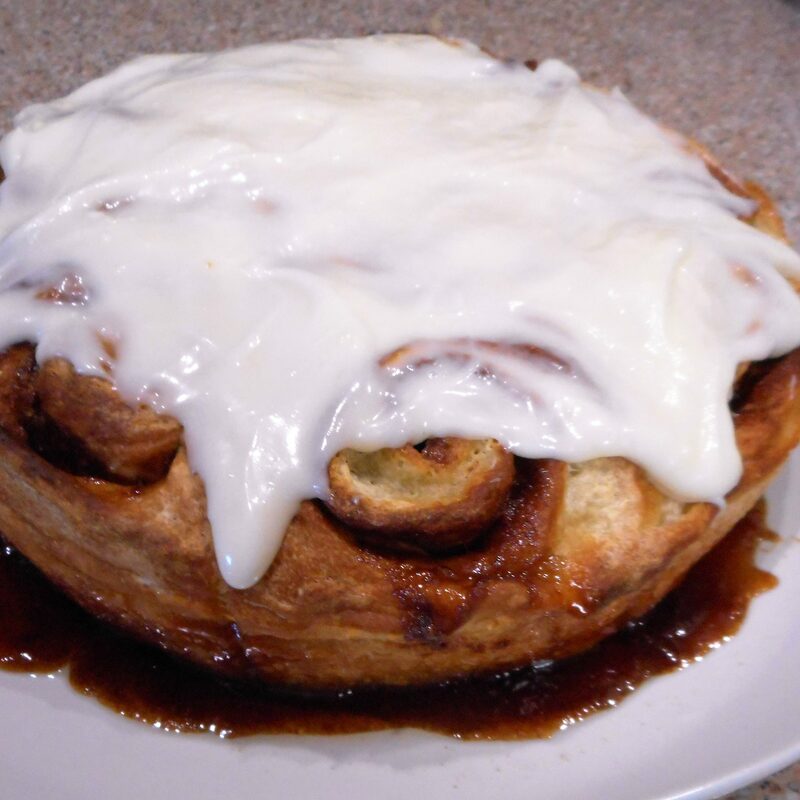 These gooey cinnamon rolls can be prepared in two eight inch cake pans of 8 rolls each or two twelve cup muffin tins, making 24 individual portions. Where the directions vary, those for the muffin tins will follow in parentheses. 1. Prepare one recipe of Whey Bread according to directions through the first rise. Divide in half and work with one half at a time. Cover the other half to prevent drying. 2. In a bowl, combine the brown sugar, granulated sugar, cinnamon, and salt. Mix completely then set aside. 3. Lightly butter two 8 inch cake pans or line two muffin tins with foil cup cake liners. 4. On a very lightly floured surface, pat the dough into a rectangle. Cover, and allow to relax 5 minutes. 5. Roll the dough into a 9 x 12 inch rectangle ( 9 x 16 ) with the long side facing you. 6. Spread the dough to within 1/2 inch of the edges with 1/2 of the butter, then sprinkle with 1/2 of the sugar mixture. Pat the sugar mixture into the dough. 7. Starting with the long side that is away from you, work back and forth to roll the dough into a tight log. When nearly complete, pull the side closet to you up over the log and pinch to seal. Roll the log over so the seam side is down. 8. With a serrated knife, slice the log into 8 (12) equal slices and arrange in the prepared pan. 9. Cover both pans of rolls with plastic wrap and then a dish towel. Allow to rise again until nearly doubled. 10. Preheat the oven to 350°. 11. Meanwhile, prepare the icing: In a bowl, use a fork to beat the cream cheese until smooth. Blend in the buttermilk and vanilla, then stir in the powdered sugar. Cover and set aside. 12. Bake for 30 minutes (25) or until evenly golden brown. 13. Let the rolls stand 5 minutes before icing. At this point, you may transfer them to a serving dish for presentation or ice them in their pans.